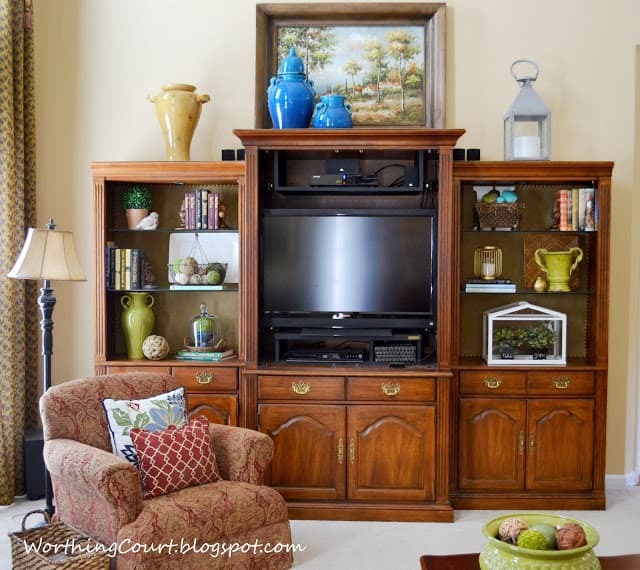 UPDATE: Enjoy these restyled bookcases from the family room in our former home. We’ve moved and are giving our new-to-us home a complete remodel. I’ve completely changed my style! Click HERE to take a look. Check out this picture taken in my family room. It was taken almost two years ago in poor lighting with my point and shoot camera. I sit at one end of the couch 99% of the time to do my blogging, so I spend quite a bit of time in that spot. I also spend a lot of time staring at those bookcases. I never really disliked them. It’s just that over time, they looked heavier and heavier and darker and darker and I grew more and more tired of the way that they looked. So…I decided to restyle them and lighten them up! I moved the painting that used to reside over the couch in my living room to the top of the bookcases, which gave me the perfect excuse to bring some pops of blue into the room. I’m really tired of the color scheme in this room. I’ve been living with red, green and gold since the 90’s and I’m sooo over it. But for now (until we decide how much longer to stay in this house), I’m making do with embracing what I already have. Gone are all of the red pottery pieces. Gone is the faux ivy bush and the scrolly heavy stuff. In their place you’ll find fewer books, some accessories that I mostly pulled from around the house and a little bit of blue. I picked up this terrarium several months ago at Ikea. The little plants were already in black pots that were perfect for writing on with chalk. I added a little bit of gold and a “garden” of green and blue fabric mushrooms to the mix. All in all, I’m pretty pleased with how they turned out. And I’m sooo glad to be rid of some of that red! Suzy, it looks so much better. I think you did an outstanding job on your book cases. I like the blue you incorporated into the family room. Have a great week friend! Excellent job Susie! I’ve been going through the same desire to change coloring in my room, but I have too much invested in it to just change it all so I can only tweak it! I like the blue you added and the different accents. You definitely swung the look in a new direction! 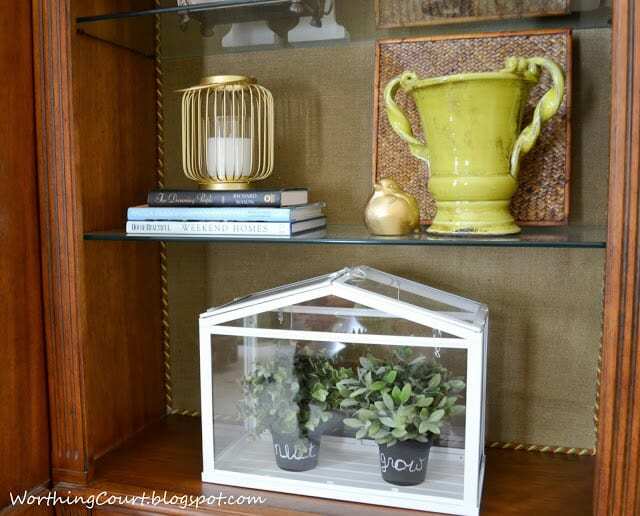 I’m getting ready to do the same thing here–painting the kitchen/sunroom and the bookcases have GOT to change! Looks great! Suzy, it looks fresh and summery. Great styling. You did a great job of restyling, Suzy. I love the pops of blue, very fresh. I’m having the same problem of not wanting to do anything major when we’re unsure of how long we’ll be in our current house. Love the changes you have made. It all looks so fresh! 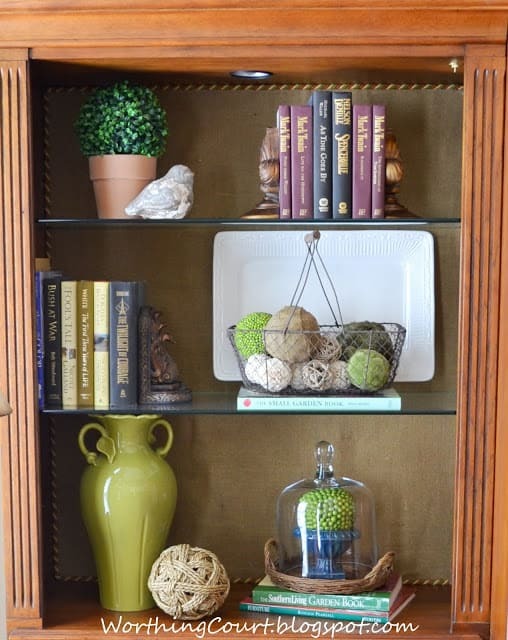 Great job Suzy…I love how you incorporated the beautiful green in the bookcases!! Happy Monday! goodness, what a difference! 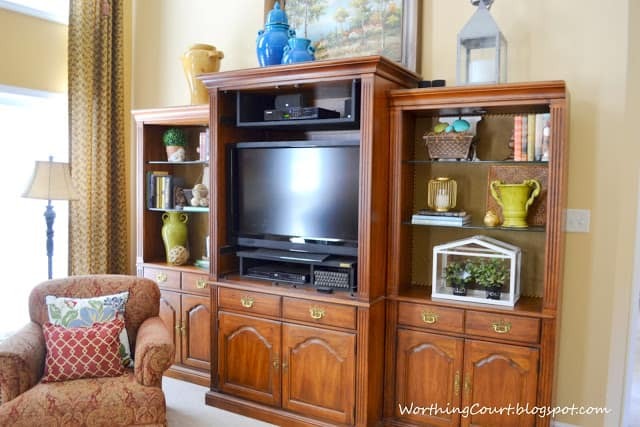 I would have never though just switching out the accessories could change the lightness of a room – but you did just that! Suzi that is a great idea! You really made a difference! The natural items really lightened up the shelves! How fresh and summertime! Looks wonderful Suzy. Light and bright. I think you did a great job of creating a new and lighter look. 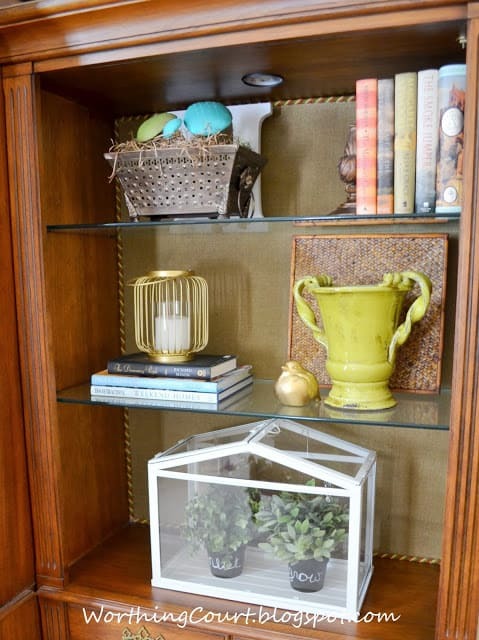 I’ve been eyeing the cute little terrarium from IKEA but haven’t pulled the trigger yet…..sigh! Great Job! I just revamped our living room by replacing all my red & gold patterned pillows with 2 turquoise and 2 tangerine/ivory combo & a blue & ivory for the couch & for the loveseat 2 of the turquoise& the tangerine/ivory white in the center. I also switched out the cranberry drapes for turquoise. 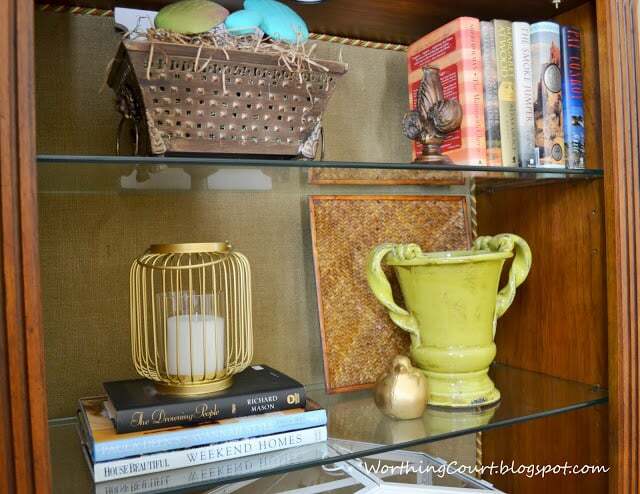 Placed a few turquoise items for the bookcase & mantel some from the store & some from my closet. 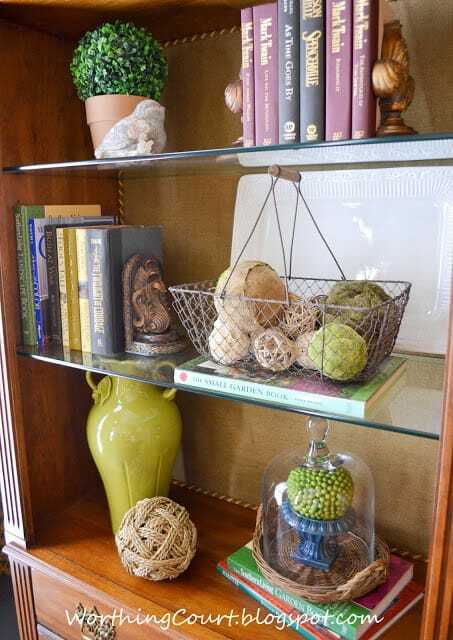 Looking to pick up a few more accent pieces vases & such for the new look. What a difference! So light & cheerful. I picked up some of the lovely decorative pillows at Belk & Kohls. Other at Home Goods all were for 12-15 a piece. If anyone wants the link or more info on the Belk & Kohls items, I can surely let you know! Wow, you did a grat job! Love the green and blue! You have such a wonderful sense of style Suzy! Shelves are always the hardest for me!!!! 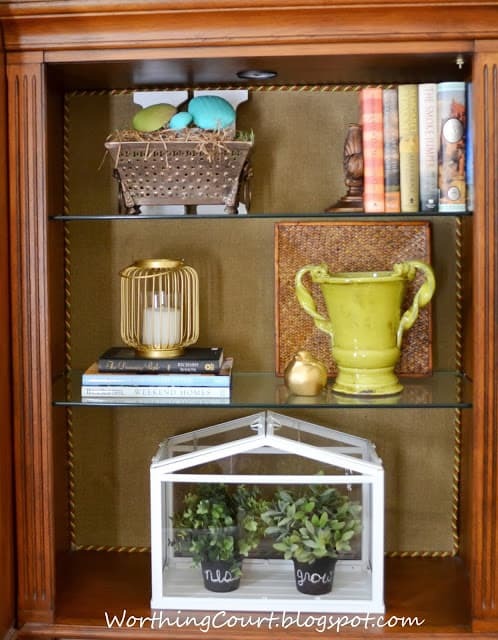 You certainly know how to style your shelves for an easy breezy summery look!!! My home was gold and yellow and red. I was very into the Tuscan look for over a decade. 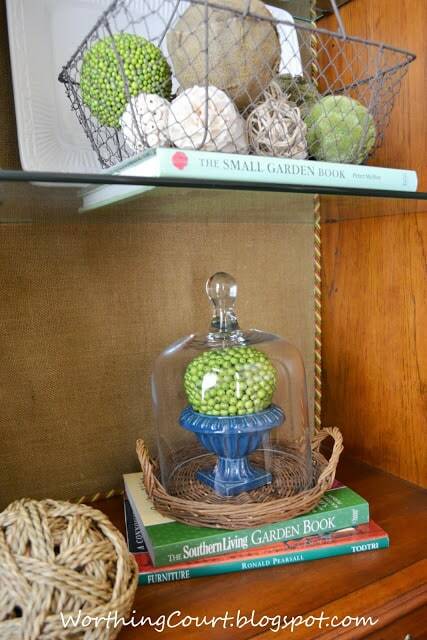 The additional pops of blue and some greens really gives you a timeless and updated look! It’s fun to see where you blog! I sit in a study that is often more cluttered than I want to admit. 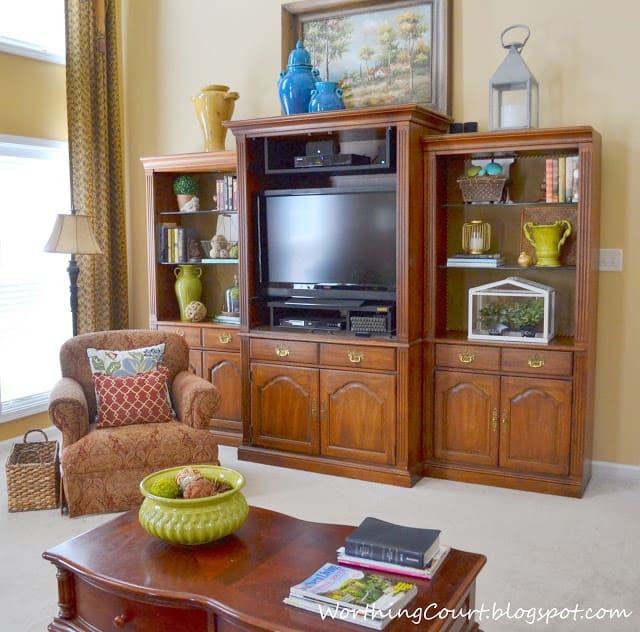 Looks fresh and bright now, funny how just a few touches can change the whole feel of a space~I totally relate, I want to redo our family room too, it feels so old fashioned after seeing all the bright white rooms with graphic rugs and trendy chalk painted repurposed furniture. For now I’m getting by with a few bright chevron pillows and accessories! Lime green always is a great choice! Beautiful! I love the fresh new look! 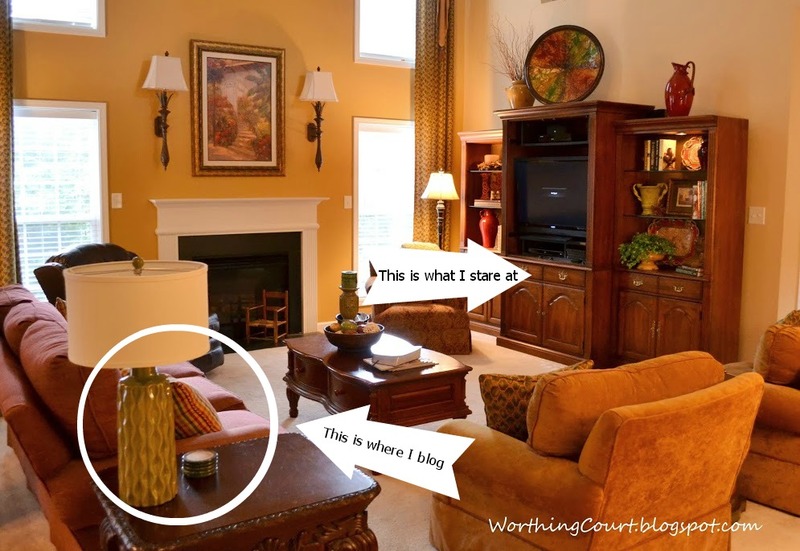 Thanks for sharing WHERE you blog – as in the exact spot on the couch! It’s always nice knowing where someone is when they write + create. It’s also nice knowing that I’m not the only one who enjoys rearranging things; it completely changes the energy in a room. Love the new look Suzy!